During this Holiday Season, celebrate those who are special to you. At this time of year, our hearts and thoughts turn to those who bless our lives today and those who have brightened our lives in the past. This year, celebrate by honouring a special loved one with a gift in honour of someone still with us or with a memorial gift to the Chinook Regional Hospital Foundation. Each gift is recognized with a personalized Christmas light ornament that will be placed in the hospital atrium from December 1st to 31st, 2018. Donor names will be listed on our website for the month of December. Additionally, a special supplement listing of all donors, memorials and tributes will run mid-January in the Lethbridge Herald. We thank you again for celebrating the spirit of giving this year by honouring your loved ones. Last year, the Lights of Hope Campaign raised over $123,000.00. This Annual December Tradition not only brightens the Hospital Atrium but proudly shows that giving and generosity in our wonderful community is alive and well. The ongoing goal of the Chinook Regional Hospital Foundation is to raise, receive and to distribute funds for equipment and programs that will enhance patient services and health programs in our community. 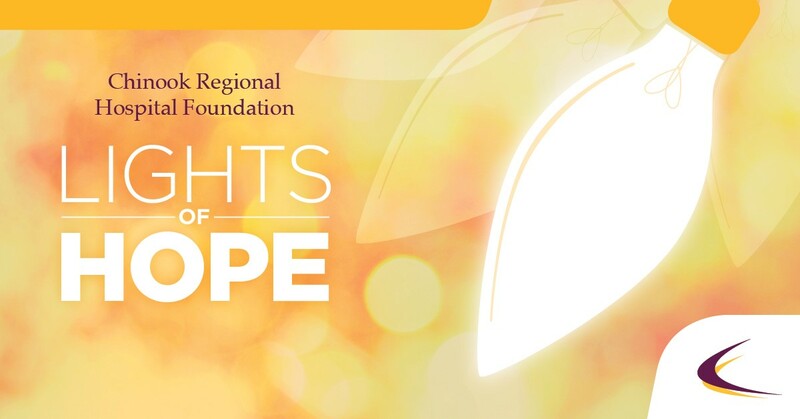 Monies raised from this year's Lights of Hope Campaign will support the ongoing renovation and redevelopment of the Mental Health Facilities at the Chinook Regional Hospital. We sincerely thank you for your gift, your support and your generosity in this season of giving.